A few months ago I received a message from a friend who is also a long time Audiophile Style reader @joelha. The message was about a new DAC that I just "had to hear." Not only that but it was from a Bulgarian company I'd never even heard of in all my audio travels and research. Oh great I thought, another DAC I just had to hear. Let me check my inbox for all the great DACs I just had to hear and put it in line to be looked at as soon as I have free time (never). I have countless message from friends, colleagues, manufacturers, distributors, etc... about products I just "have to hear." This is a first world problem of the highest order, but it's a problem nonetheless. It's hard to find the signal in all the noise. When I decide to take a chance on one of these products, I have to get the whole story about the product and company and I must understand the motivation of the person recommending the product. My decision to bring the product in for review comes down to trust above anything else. I have to trust the person on the other end of the email/phone. In this instance, I absolutely trusted the person who contacted me about products from APL Hi-Fi. I gave him the green light to help me get the products here for review. What follows is my review of the stunning DSD-MR digital to analog converter and DNP-SR Streamer. I'll start with the DSD-MR (DSD-Master Reference) DAC. It's nice when I can review components without first knowing too much about the price or the design. In this case I actually don't know how much the DSD-MR costs. I've been told it's expensive, but that's a relative term if there ever was one. As part of my purposeful ignorance I also didn't inquire about the design of the DAC until weeks after I'd received the unit. I wanted to put many hours of listening behind me before I asked APL Hi-Fi for additional information. Partly because I didn't want to be influenced by this information and partly because it's fun to listen and venture a guess as to what's going on inside that's contributing to the sound outside. Let's skip the main course for now and get right to dessert. The APL Hi-Fi DSD-MR is one of the most unique sounding and enjoyable DACs I've ever heard. To eliminate any ambiguity, by enjoyable I mean one of the best I've ever heard. I don't write reviews that force people to read between lines. I say exactly what I mean. The APL Hi-Fi is one of the best DACs I've ever heard, and I've heard way more than I can count. From flagship to fledgling and everything in between, I've heard most of the offerings from most of the companies in the industry over the last ten years. I can conclude without a doubt the DSD-MR is in my top five and may be the most memorable of all. I listened to every type of music in my collection through the DSD-MR. I'm sure many audiophiles can relate to getting a new piece of gear that's so good one just has to listen to "everything" to "see" how it sounds through component X or loudspeaker Y. From minute one with the DSD-MR I knew it was special. I can't think of another DAC that sounds like this one. The DSD-MR sounds more like analog tape and vinyl records than anything I've ever heard. Period. Listening to the entire Gary Karr: Bass Virtuoso album several times, I heard shades of the Schiit Yggdrasil through the DSD-MR, but only shades. I remember how much I loved the sound of this album through the Yggy, but the love and appreciation I have for this album now that I've spent so much time listening through the DSD-MR is much greater. Karr manages to pull every sonic attribute out of his double bass on this recording and it sounds so lush through the DSD-MR. I didn't think it was possible to hear a sip of sweetness, a bit of bloom, and delicate details simultaneously throughout the entire 40Hz to 400Hz frequency range of the double bass. They seem mutually exclusive until one spends time with the DSD-MR.
Track one on this album, named Sonata, reminds me of an Itzhak Perlman emotional rollercoaster. It's a winding road with ups and downs that are nothing but pleasure for the ears. Somehow the APL Hi-FI DSD-MR manages to squeeze more emotion out of this track than any other DAC I've heard. I know it may sound funny, but this is an emotional DAC. Over the last couple months, I've sat down with a hot pot of black darjeeling tea and listened to entire albums, like Bass Virtuoso from Gary Karr, several times. The DSD-MR has figuratively pulled me into my listening chair more than any product in the last few years. The sweet sound from this DAC is like a drug of which I can't get enough. Track three on Bass Virtuoso, Valse Miniature, demonstrates one attribute of the DSD-MR that I haven't heard in another product. I can describe this only as vibrancy without distractions. This recording is full of tape hiss and this hiss is clearly audible. It doesn't bother me in the least. In fact it lets me know I'm getting everything from the recording rather than getting only what some de-noising plugin let through as music. Now here's the twist, through the DSD-MR the vibrancy of Karr's double bass stands out so much from the noise that it's almost three dimensional. The tape noise is in the background and it nearly falls off my listening radar. I can't describe this as blacker blacks and a lower noise floor because I don't think that's what's going on here. For some wonderful reason the noise disappears and the music is seriously front and center. I could write about the aforementioned recording with the DSD-MR until my fingers hurt, but it's probably better that I move on. Passacaglia performed by the Kansas City Orchestra and recorded by Keith Johnson for Reference Recordings is an "old" favorite of mine. This piece of music encapsulates a bit of everything when it comes to lows, highs, delicacy, transients, etc... and it demonstrates the best and the "worst" of the DSD-MR. When I say worst I mean one area where the DSD-MR is better than many DACs but not as good as some of the other great DACs. If anything, perhaps I hear a trade-off or design decision that must be made because every designer has to deal with engineering compromises. It's how these are handled that's key for the consumer. It should also be noted that other great DACs may best the DSD-MR in this category, but certainly not in other categories. Readers should also note that what I hear is an incredibly small difference. I don't beat around the bush when describing what I hear. What follows is an exact description that doesn't force any reading between the lines. It should also be noted that to date, neither Alex Peychev nor any of his customers have heard the sonic qualities I describe below. Alex was surprised to read what I wrote. Last, don't blow this out of proportion. The opening several minutes of the track sound fantastic. The string section sounds like it's sweeping around the room with a vibrancy and eeriness that grabs one's attention. In typical Reference Recordings fashion there's a raw sound to it that places the listener right in the concert hall with the symphony. As horns come and go four minutes into the track the sound is spectacular. The shimmer of cymbals can be heard, starting delicate and gaining force before handing off to the eerie strings that slink in and take over. This is all delightful in a sonic sense. As the orchestra ramps up with bombastic drums and loud cymbal crashes, the sound loses a bit of of detail. At the 5:45 mark of this track, with a 26 R128 dynamic range score, the DSD-MR shows that the transients can cause it to round the edges ever so slightly and group some instruments together. 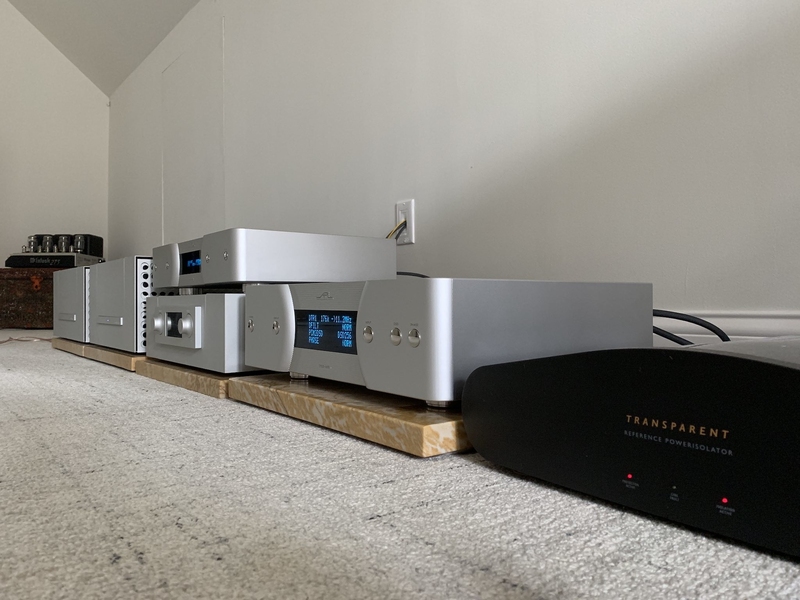 Other flagship DACs reproduce these transients better than the DSD-MR, but those DACs definitely don't sound as sweet, vibrant, and emotional as the DSD-MR. I believe this is the design trade-off I can hear. If readers haven't heard the new Norah Jones track Just A Little Bit from her forthcoming album Begin Again, I can't recommend enough that they take some time to give it a listen. I'm enamored by this track. In fact, if audiophiles wouldn't have burned out Norah's first album Come Away With Me and seared her voice into my brain, I'd like this new album even more. That's a personal issue though. Just A Little Bit sounds spectacular through the DSD-MR. The track's deep and rhythmic bass foundation juxtaposed with Norah's smooth but cutting voice is a treat for the ears. I've listened to this album, and this track alone, several times per day since I discovered it last week. It's just so enjoyable to hear the aspects I just mentioned, but also the delicacy of the snare drum come through as pure as the driven snow. I was inspired by this and other tracks from Begin Again to bring up Norah's previous album Day Breaks. It's a return to form for Norah Jones after stretching her creativity after the success of her debut album. A hidden gem on this album is a track named Flipside. It may not be everyone's cup of tea, but it has grown on me. Dr. Lonnie Smith's Hammond B3 can be heard throughout the track in the background and it's just such a sweet sound. Listening through the APL Hi-Fi DSD-MR enabled me to clearly pick out each element of this at times chaotic track. Even Norah's Wurlitzer is engaging and light and airy hi-hat brushing from Brian Blade is clearly audible if the listener wishes to pick up on it. Picking up on things is something this DAC enables very well. What I mean is that the music is a whole just as the band plays it, but the DSD-MR has terrific separation of instruments and a vibrancy that brings instruments out into the room. It's as if the specific instrument one is listening for has a spotlight shone on it. I can't describe it any other way. Quickly before moving on to the details of the DSD-MR and DNP-SR and how they work together incredibly well, I'll mention the album Moon Ray from Yoshio Otomo Quartet with Tsuyoshi Yamamoto. I have the JVC XRCD of the 1977 Three Blind Mice release. The second I pressed play on the first track I thought to myself, oh wow this is good. But when Otomo's saxophone kicked in a few seconds later I felt like I'd just received a shot of a potent painkiller. I melted in my listening chair and put my work on hold for the time being. This album and this DAC just can't be denied. I hope that by now some readers get it. This DAC is special. 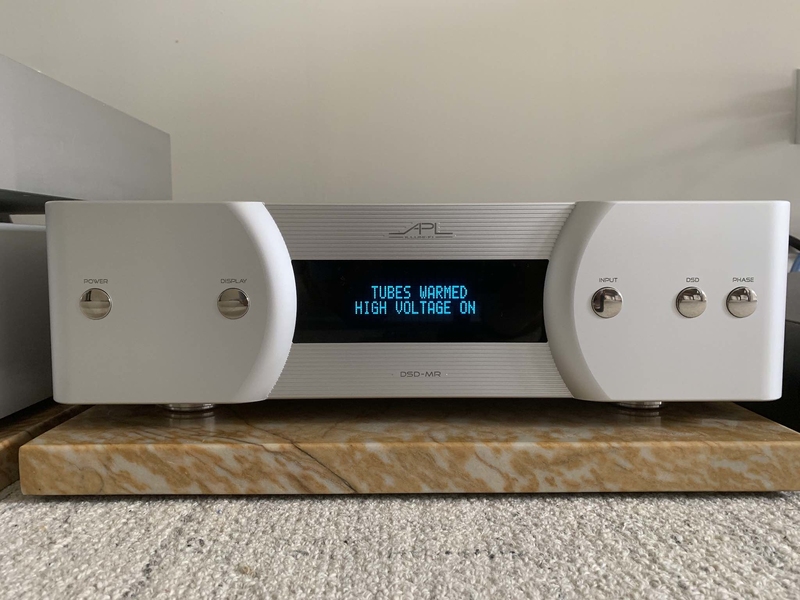 After listening for weeks, I asked APL's Alex Peychev about the DACs architecture in an attempt to discern what makes it so special. Sure the sound is special, but I was interested in how Alex obtains this sound. After reading the first paragraph of Alex's response to me, my suspicions about his design philosophy were validated. "The DSD-MR design is inspired by the sound quality of our reference Kuzma/Dynavector vinyl playback system. After many years and countless experiments, it was clear to me that DSD most closely approaches the sound of analog. We also performed similar tests using respected reel-to-reel machines to the same effect. Not that PCM cannot sound good, it does. But, managed properly, DSD produces a fatigue-free sound that is natural, smooth and effortless, just like pure analog." This describes exactly 100% what I heard through the DSD-MR. 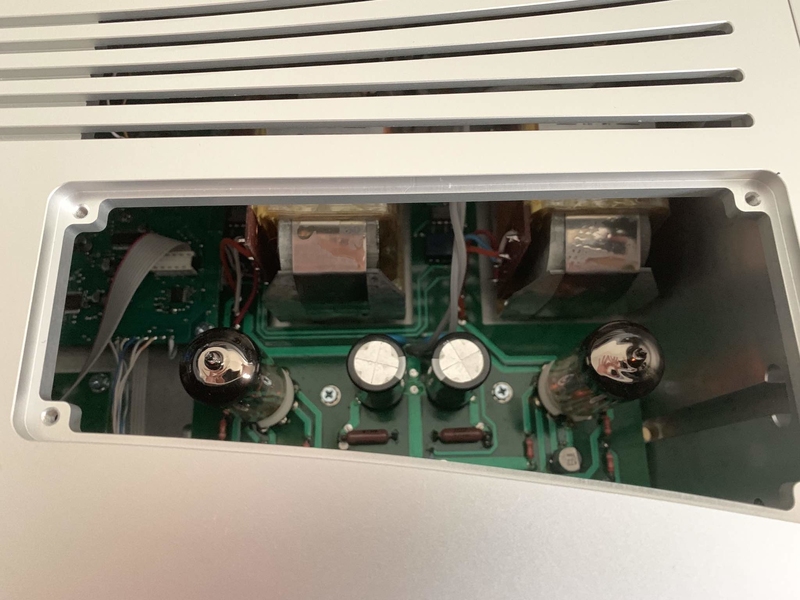 This DAC is so analog, I'm willing to bet vinyl junkies could be tricked into thinking it was all analog, if it wasn't for the lack of pops and ticks. Heck, put on a vinyl rip and I'll put my money on this DAC fooling most of the people most of the time. 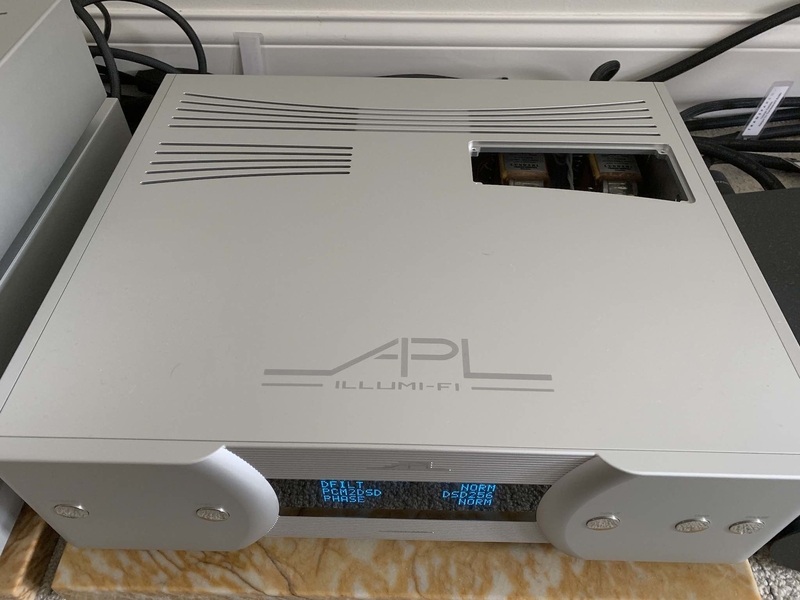 APL Hi-Fi obtains this sound by converting DSD to analog without altering the DSD data in any way and converting PCM to DSD128 or DSD256 (user selectable). The DSD-MR uses pure DSD filtration with linear-phase FIR filters and analog filters followed by a differential Class-A transformer-coupled tube output stage (using ECC99 tubes). The DSD-MR contains no OpAmps, discrete transistor stages, mechanical switches, coupling capacitors or negative feedback on the analog signal path. 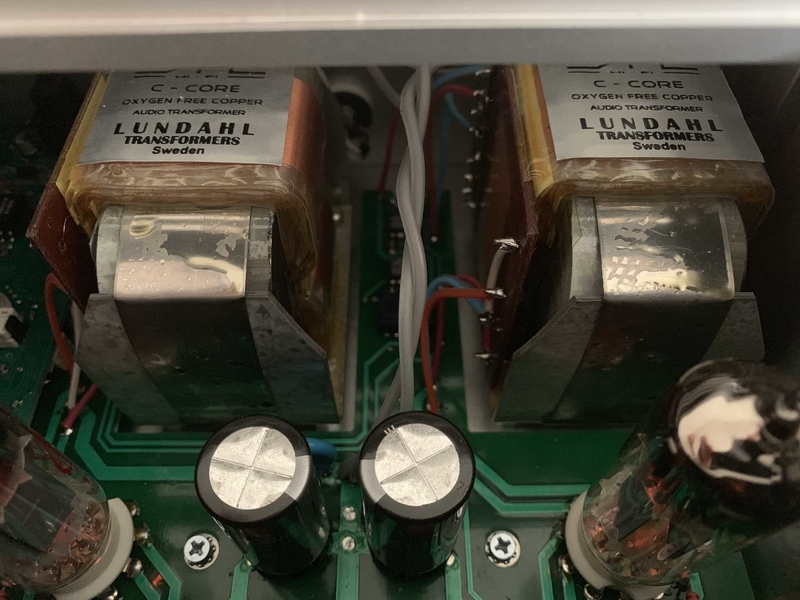 Instead, the DSD-MR uses custom audio transformers, wound with Oxygen Free Copper, made by Lundahl Transformers in Sweden. Both the analog domain DSD filter and tube output stages use those transformers. When the DAC receives PCM data it uses an FPGA-based PCM to DSD modulator for conversion. According to Peychev, "we have settled on two filters, both with 64 bit precision and linear phase. One is a slow rolloff and the other sharp rolloff. There is also a zero filter setting which completely eliminates the digital filters and provides the best impulse response. With this setting the DSD-MR achieves sound quality similar to non-oversampling DAC designs." I listened to the filters and settled on what's called the NORM filter for most of my listening but I really like the ZERO setting that bypasses digital filters as well. Both sounded wonderful and engaging. Once the DSD-MR has the data in the DSD format, it uses Peychev's own design for digital to analog conversion. This isn't an R2R either. The actual DSD to Analog conversion is based on a linear phase FIR filter, followed by a passive filtering stage in the analog domain. I was unable to pull any additional information out of Alex about this design. I believe he wants to keep this design to himself and I don't blame him. For Alex it's all about getting as close to analog as possible and his own custom design was his way of getting there. The DSD-MR may be the heaviest DAC I've ever lifted. At 54 lbs it weighs nearly 20 lbs more than the dCS Vivaldi, and it has no volume control. The DAC has all the standard inputs such as AES, S/PDIF, TosLink and USB going to unbalanced RCA or balanced XLR outputs. What's different are the DTR inputs. According to APL, "DTR input uses proprietary encrypted DSD, as well as PCM via balanced LVDS transmission, similar to I2S." I tried all the inputs on the DSD-MR and found its DTR input to sound the best without question. I didn't want to believe it because I often think these proprietary inputs are a way of locking customers into using another component from the same manufacturer but, given the performance APL is getting from DTR, I have nothing but great things to day about it. This raises the question, how did I get a DTR capable signal? I used APL Hi-Fi's DNP-SR Streamer. This is a surprising product in many ways. It's the first product I know of that uses AURALiC's ARIES hardware and configuration software (if necessary). APL licensed the Auralic pieces rather than recreate the wheel and spend way more money than necessary. Very smart decision for a small company. The DNP-SR Streamer can be used as a Lightning endpoint supporting all the functionality of an Auralic Lightning device or it can be used as a Roon Ready endpoint. I used it in Roon mode for the entire review period. The DNP-SR Streamer ships from the factory in Roon mode and only requires the user plugin an Ethernet cable or connect via WiFi to start listening. Of course APL didn't just take an ARIES and stick it in an expensive chassis. The DNP-SR is, according to Alex, "the only streamer in current existence to use absolutely 100% low-noise linear power." One more important note about the parts selection for the DSD-MR DAC, Alex is absolutely meticulous. Every part that goes into the DSD-MR is hand selected as only an audio perfectionist can do. Not only each model or version of the part, but the actual part that's placed in the DAC. To get the best sound, one has to inspect every part in a batch of parts rather than just plop them in the product. There really isn't much to the setup or configuration of either the DNP-SR Streamer or DSD-MR DAC. They are simple devices designed to sound like analog HiFi. The APL Hi-Fi DSD-MR DAC is a unique product to say the least. It's unique in its design and sound quality. Its custom designed digital to analog conversion and FPGA PCM to DSD modulator are part of why the DSD-MR sounds the way it does. APL's Alex Peychev had a singular goal in mind when designing the DSD-MR, to get as close to analog as possible. Keeping control of everything going on inside the DAC is the only way to control everything coming out of the DAC. The sound emanating from the APL DSD-MR DAC is nothing short of stunning. It's an amazing component that put my listening pleasure on a different level. Pure sonic enjoyment and blissful ignorance of the world around me is how to describe my mornings when I sat down with some fine tea and a favorite album or two or three. It's literally hard to stop listening when the DSD-MR is in one's system. Feeding the DSD-MR with the APL Hi-Fi DNP-SR Streamer resulted in the best sound quality without question. Comparing this stellar sound to other DACs, I'd say it's much closer to that of dCS than Berkeley Audio Design. 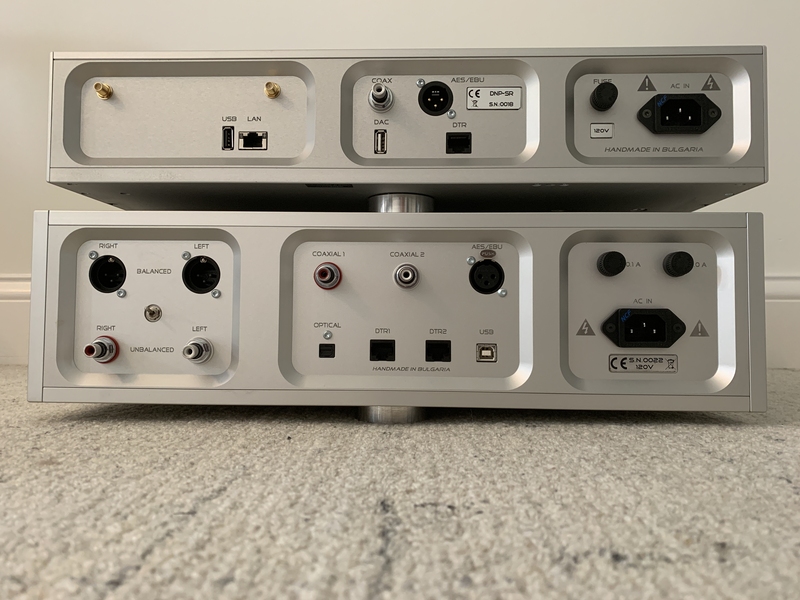 The APL DSD-MR isn't one of those DACs that will tear one's head off with sizzle or grate on one's ears after long periods of time. It's one of the most enjoyable DACs currently available and certainly the most memorable. It reproduces a sound I won't soon forget, much the same as I can't forget the sound of my first electrostatic loudspeakers. There's something about the APL Hi-Fi sound that's exceptional and seductive. The DSD-MR and DNP-SR combination has my highest recommendation. As biased as I might be representing APL in Scandinavia, this is an amazing product which keeps beating all possible contenders coming through our showroom here in Stockholm from the big names. It strikes a perfect balance in between analytical and musical. I often wondered where Alex has been over the years. I remember having long talks with him back in the Modwright Transporter days at RMAF and CES. He was a modder of sorts back then, and the APL name seemed to fall off a lot of folks' radar, especially mine. Nice review, albeit another ridiculously priced setup IMHO. This is not meant to be negative, but for that price it better be really good. I'd be interested to hear how it compares to some of the other best setups, like a dCS stack. I first heard of Alex back around 2002 when he was doing crazy modder things with Esoteric transports and DAC which a the time were already considered over the top. I always admired his technical prowess though as @ted_b pointed out his products dont come cheap. Yeah, I certainly hear you about the price. The best of anything isn't cheap or anywhere relative to those of a lesser quality. The koenigsegg Jesko is $3,000,000 and it's sold out. Certainly not millions of dollars better than many other cars on a linear scale, but life doesn't work this way. I wish it did. 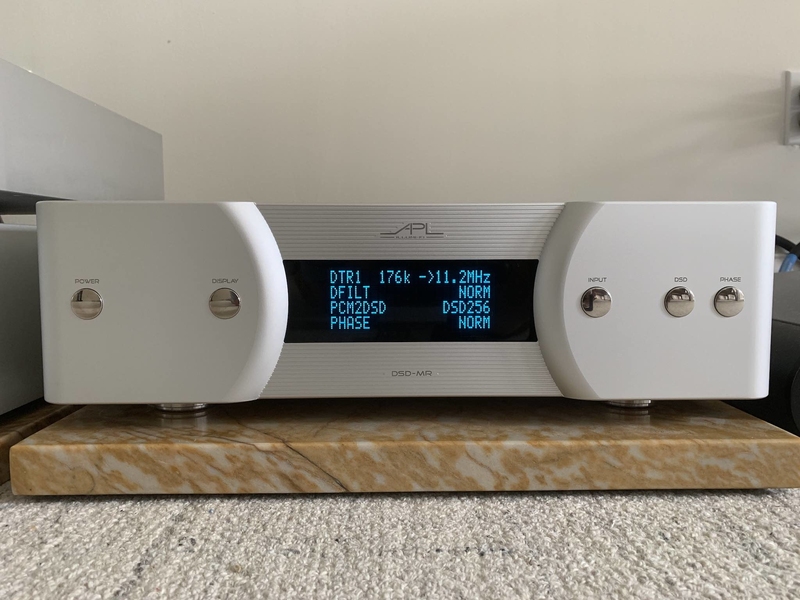 This is probably the most expensive DAC I've ever reviewed. If I had the money I'd certainly purchase it. I don't see the APL products as priced insanely for no reason like some other products. This stuff is hand built one at a time using the best components, and on a tiny scale. I too do not wish to be negative but I share the sentiment expressed here by those above about the pricing of these products. I read this very good review and then felt very sad at the end when I saw the price of these items. This kind of stuff just makes our hobby look like it is for a bunch of over privileged kooks to the rest of the world. It is no wonder that the high end of audio is shrinking away as those of us who are of a certain age naturally leave it. As there are fewer and fewer to buy at this level, the price will continue to rise as the sellers try to make more money from a shrinking base. The future will eventually be that what we now would call mid-fidelity will be the new high end and the rest will be mass produced product of varying sound quality and build quality with low prices. Of course there will always be a few sellers of super expensive stuff and a few buyers for it but it won't be worth reviewing it either online or in print. I don't mean to pick on this one particular seller because this is the trend now with nearly every seller of high end gear. They are all caught in the upward pricing spiral as their buyer base shrinks. Sadly, I see no way out of it. 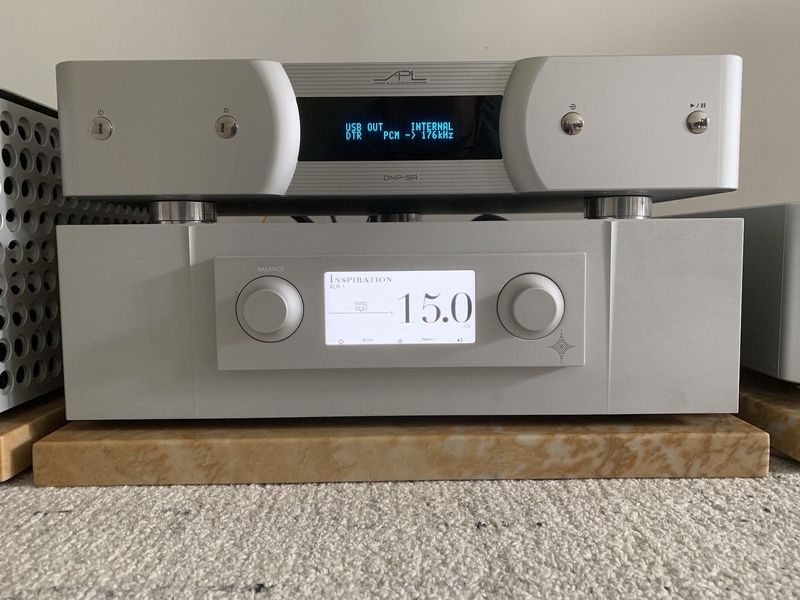 "APL Hi-Fi obtains this sound by converting DSD to analog without altering the DSD data in any way and converting PCM to DSD128 or DSD256 (user selectable)." 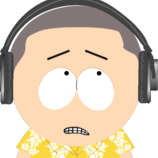 Chris, did you compare converting PCM to DSD128 vs. PCM to DSD256? Yes, my preference using the APL DAC was DSD256. The best of anything is expensive. All industries have the same issue. Do you still have the dac and streamer in your possession? I ask cuz was wondering what a software upsampler like HQPlayer would do to present the dac with already converted PCM-to-DSD, or DSD upsampled to DSDnnn (the idea, of course, is to let the dac do less heavy lifting...unless of course that lifting is its secret sauce). Yes, I have both sitting right next to me. Sure, it's possible attempt this. Marcus, can you or @The Computer Audiophile please clarify if APL will demo their products at HIGH END Munich in May? Thanks for such a great review, I really enjoyed reading it. Well done. I wish you'd stated the price at the beginning though, so the shock would have been less perhaps. It maybe well be worth the asking price but one thing I find unacceptable is the lack of a volume control. I personally refuse to buy a DAC without a volume control and at this price level I would certainly expect one. Most of your description of the APL DAC sounds very similar to my Lindemann Musicbook DSD 20, which is also claimed to sound very analog like. It also upsamples everything to DSD 128 or DSD 256 with a preamp and a builtin streamer. Apparently there's an upgrade coming soon too in the form of both hardware and software. I was wondering you had heard the Lindemann DAC and or might be interested in checking out the upcoming version as a comparison. Again thanks for the great write up. Yes, APL will be in Munich with products. UPDATE: It’s possible APL will not have components at the show. 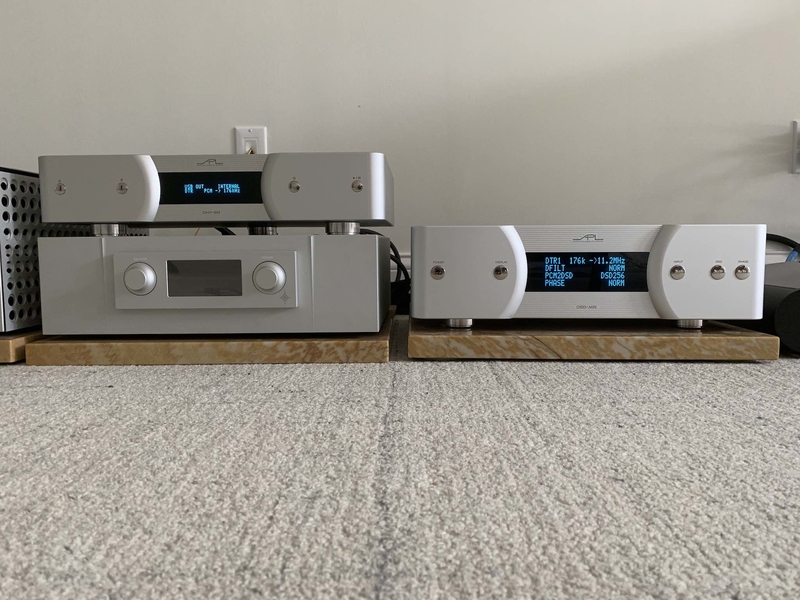 $45k is obviously an insane amount of money... for a DAC! But Alex Peychev makes much cheaper products too. A couple of years ago I bought one of his 'femto clock' boards to replace the SAA7220 filter in an old TDA1541A-based DAC I had lying around - I just fancied doing a bit of DIY. Alex's board totally transformed the sound of the DAC. Total cost? $95! He was very responsive to all my questions, and a pleasure to do business with. The APL Hi-Fi DSD-SR DAC is tens of thousands cheaper. How about pix of the back panels? I own the DSD-MR and DNP-SR and I think they're both fabulous and worth the money. Just because products like this exist at these price-points doesn't mean there aren't other excellnnt alternatives at lower prices. The Schiit Yggdrasil being a great example. Having been in the hobby since I was in high school (which was not recently), I've never seen a time when there have been more fantastic audio options than today. That we even have the option to buy products from Bulgaria, China or Poland for example, is evidence of this fact. And much of the great product available internationally can be purchased on-line. The market for products produced overseas only 10 years ago was nowhere near as good. As for this high-priced product killing the industry, I have to respectfully disagree. How many people would you have to stop on the street before you could find someone who has ever heard of Magneplanar? They've been around forever and you'd have trouble finding a better value in audio. But the vast majority of people in this (or any) country have never heard of the name let alone aspired to owning their product. I realize the apparent hypocrisy of my owning this product while telling others not to feel bad that they can't. I get it. I also understand reading a phenomenal review like the one Chris has written, maybe getting a little excited about the product as i read the review, only to find at the end that it equals the price of a luxury car. But there are audio products I'd love to own and simply can't or won't spend the money to buy. For those who care, APL has the DSD-SR DAC, very good I understand, at less than half the price. Yes, I know. Still a ton of money. Finally, I’d strongly urge those who are able, to hear this dac. At the very least, I believe it offers a compelling benchmark for what one might want to hear when making other digital audio purchases. I do not think that both products are comparable, Lindemann uses AK4137 SRC for PCM to DSD conversion. Not the best solution in my view. I don't see why DACs with different components, methods and approaches cannot be comparable. Comparison I was making was the analog like sound which Lindemann also aims to achieve and succeeds IMHO. The APL DAC seems to sound fantastic, and I sure would like to hear it myself for a direct comparison. A flagship or halo product should serve a valuable purpose, bringing attention to a brand and providing trickle-down technology and manufacturing expertise that can be executed in more cost-effective products... rather than simply enabling conspicuous consumption for status seekers. APL DSD-MR is my reference DAC that I've had in my system for over a year now. Before that I had a previous model, DSD-M, and before that, DSD-S, which started my journey with APL. Each upgrade was a big step up and the DSD-MR is by far the best DAC I've heard. I also prefer the DSD256 & NORM filter setting in my system which is the most natural and detailed to my ears. That said, the DSD128 setting has a bit better trarnsient response and is a bit sharper, but it doesn't sound as spacious. The DAC is very sensitive when it comes to power cords and vibrations. It is worth playing with both to extract the full potential. I'm glad you posted because I owe you a very big public "thank you" for introducing me to Alex Peychev and APL. Spending time with you and hearing APL's components were absolutely the highlights of my visit to the Warsaw Show.